Yesterday I read this article about MDM discounting practice and MDM commoditization. The article argues that due to the introduction of more MDM functionality in both iOS 7 and Android OSes, MDM solutions are getting commoditized. The article is partially true and fundamentally wrong at the same time, so thought I would address it in this blog post. The MDM market is healthy and growing. 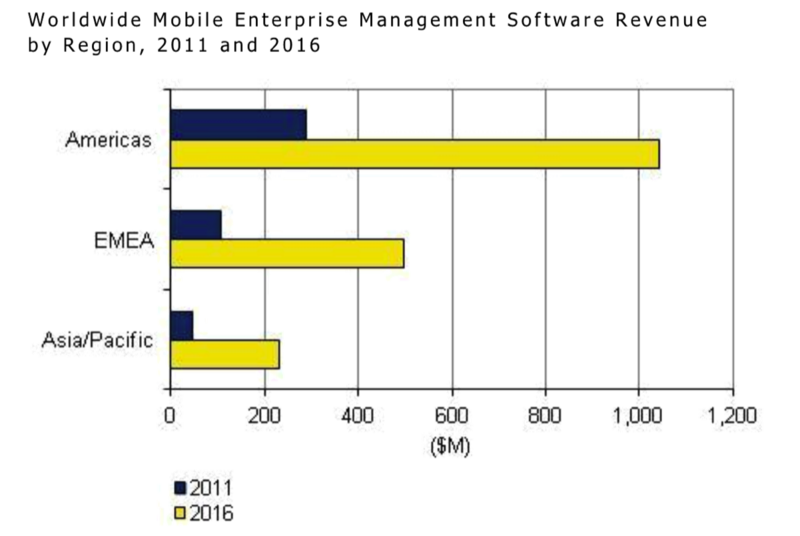 IDC believes this is going to be a 1.7B market by 2016 and this does not take into account the adjacent markets such as MAM (Mobile Application Management) and MCM (Mobile Content Management) being formed and converging into EMM (Enterprise Mobility Management). The latest MDM Magic Quadrant from Gartner shows a clear separation between the leaders (MobileIron, Airwatch and Citrix) and the rest of the pack. Read this other post for my analysis of the Magic Quadrant. MobileIron is a private company and we don’t disclose our revenue yet, but our books are audited and here is what I can tell you about price trends. MobileIron ASP (Average Selling Price) has been pretty constant since we started shipping product, but here is the kicker: our ASP has been going up in Q1 and Q2 2013. So, if there is a commoditization of the market, we are not feeling it and it is not affecting us. Now, let’s take a look at the business models of the other players in the Magic Quadrant. Citrix is hooked on a $300-600 SKU with their legacy app publishing and desktop virtualization business and I don’t see how they can afford to drive prices down. They need mobility to drive growth. They will probably create a uber bundle of their existing products and the mobile platform they acquired from Zenprise and try to upsell their installed base. Smart. They did it with their Desktop Virtualization product before, but customers and prospects need a solution for their mobile challenges today and we invite them to put each product to the test and strongly avoid the “do you want fries with that” approach. They are the most aggressive vendor with pricing practices based on our experience competing with them in deals. Given that they are a private company and we don’t know their revenue and profitability numbers, I will leave it to the reader to go speculate on the why. Maybe the answer has to be found in “Cautions” section of the Gartner Magic Quadrant. As per Citrix above, we recommend that prospects and customers put all our products to the test in their labs before making a strategic decision. I believe that the result of the business models and pricing dynamics explained above is that all other players in the market are indeed under pricing pressure and are responding to it. We stay focussed on delivering a value product to our customers because they don’t mind paying for value. The article I mentioned above, is perpetrating a misconception about iOS 7 and MDM, that is iOS 7 (and other Android technologies such as Samsung SAFE and Samsung Knox) are commoditizing many MDM functions by including them into the operating system on the device. This is more than a misconception, it is the opposite of what is going on. The reality is that iOS 7 is making MDM even more front and center in the management of Apple devices in the enterprise. Check out this page on the Apple web site and search for MDM, you will find sentences like “The MDM protocol in iOS 7 includes a number of new commands, queries, and configuration options that make third-party MDM solutions even more powerful”. It is indeed true that Apple is adding a lot more MDM APIs into the operating system to manage things like Open in, per-app VPN, SSO and so on, but these are client side APIs that do nothing on their own. To leverage these APIs organizations need a server-side management platform such as the one provided by MobileIron and other players in this space. And with iOS 7 Apple is saying pretty clearly that if you want to leverage these new APIs, you need an MDM profile on the device. Period. Before iOS 7, a number of companies including MobileIron made up for the lack of these APIs but adding them on top of the OS. iOS 7 will standardize all this and create the basis for a new inflection point in the adoption of mobility in the enterprise, especially around mobile applications. We are THRILLED about this at MobileIron and we are busy innovating on our platform to put these new MDM, app and content APIs to work for our customers. Well stated! iOS7 and Knox are game changers for the leading MDM companies. We are now at the “crossing point” where the pragmatists, conservatives and even the skeptics race to embrace. leverage and manage mobility across their enterprise. Hold on tight! Might I add in your analysis, that SAP has changed the game here with a offering of $1.11 per device per month for Afaria for pure MDM based on our Cloud solution in partnership with Amazon. Have they? We rarely see them in deals. BTW, this validates my point that the market is only commoditizing for rest of the companies. Of course MDM is becoming commoditized. At last count over 70 players all pretty much offering the same feature set. It’s only the bigger companies that manage more than phones that will still be in the game in a few years time. Well, it is kind of my point. It is commoditizing for the 68 players that did not get traction, did not add enough value or are doing it as a sales tactic. How do you differentiate from AirWatch, Good and Citrix? It’s all the same features on paper. It is a highly competitive market and we encourage prospect to try the products. Slides are easy to reproduce, making this stuff work at scale is hard. – Citrix, they bough Zenprise. Before the acquisition they were almost completely off the radar form a competitive perspective. They are popping up more now because of Citrix’ channel and sleek marketing. Make sure you try the product. – Airwatch, we see them the most. Very aggressive. 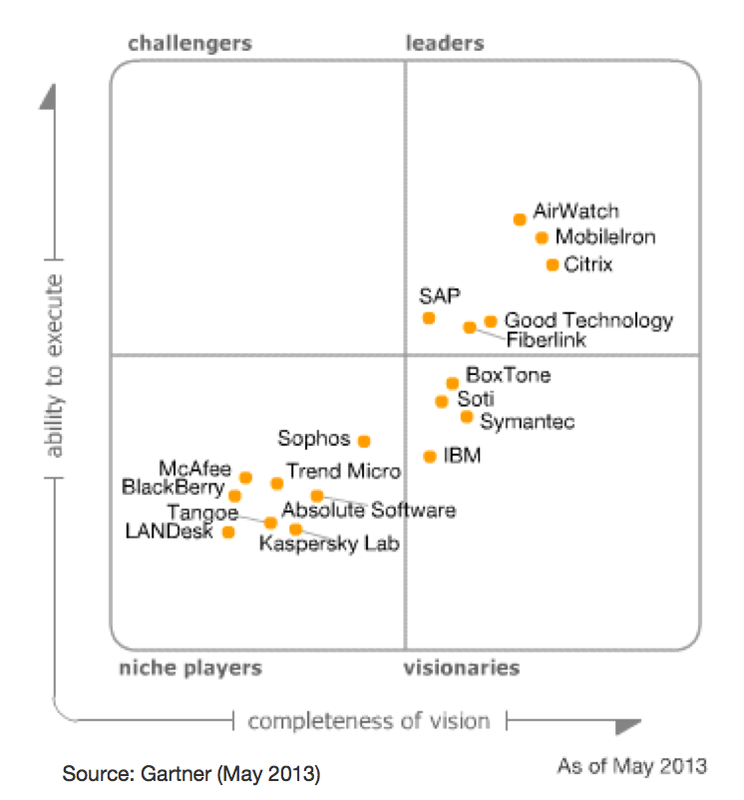 I would recommend you to carefully read the AW strengths in the Gartner Magic quadrant even more than the Cautions “AirWatch supports containerization of corporate email, browsing, content and applications, mostly through integrating third-party technologies such as NitroDesk’s TouchDown, Enterproid Divide and Samsung Knox.” and the Cautions. Put us to the test. We just turned 100K devices deployed with MDM, eMail, Apps, Certs at a major carrier. Our stuff works.